Easy entry of Competition co-ordinates/ Routes via PC with USB cable. FAI-conform flight data are saved until landing. The recording ratio is adjustable according to flight mission between 1 and 60 sec., upon arrival at Waypoint sector the ratio is automatically switched to 1 sec. and an acoustical as well as optical signal is provided to the pilot. It is possible to record up to 290 hours flight time. 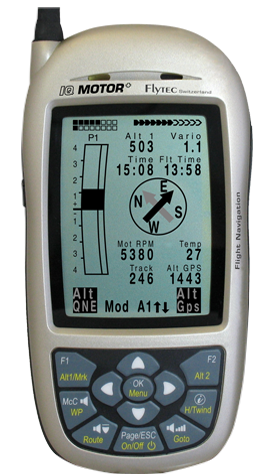 For each flight are recorded: GPS-position, altitude (air pressure and GPS-value), TAS, speed over ground, time, marking for positions. Easy data transfer via USB interface to the PC. IGC- and NMEA-data are available. IGC data are provided with digital signature, so that manipulations are identifiable.